This video is from a live demo I did on Wed. Nov 19th, 2008. The topic was staining blotchy woods. After the demo, I’ve included a portion of the Q&A from the chat room. Thanks to everyone who participated! THANKS for recording and posting. Very much appreciated. Thanks for posting this Marc, always hate to miss the live stuff. In reference to the longevity of finishes when exposed to air. I wonder if you could fix a tap (‘Faucet’ in American?) to the can? i.e draining the finish from the bottom and never exposing it to the air? Looks like you uncorked a another great video, Marc. Thanks. Q: I have used General Finishes Seal-A-Cell as a base coat and then applied multiple coats of Arm-R-Seal. I started with the Seal-A-Cell because that’s what the manufacturer recommended, as I recall. The results were great, but I’m not sure what the difference is between the Seal-A-Cell and the Arm-R-Coat. Is the Seal-A-Cell really necessary, or helpful as a base coat? Very interesting idea Wizer. Now someone just needs to invent the Varnish Tapper. :) But I love the concept. Good question Germain. I used to do the same thing because I was actually under the impression that Seal-a-Cell contained some raw oil, as in an oil/varnish blend. I thought this would make for a nice base coat that you could then top with a hard-curing varnish like Arm-R-Seal. After years of working with the stuff, I have come to the conclusion that Seal-A-Cell is nothing more than a wiping varnish, with a slightly different formula that Arm-R-Seal. My guess is it contains slightly softer resins, but I have seen little to no evidence of it containing any oil at all. In some side by side tests, I have had a lot of trouble telling the difference between a board finished with Arm-R-Seal only, vs one that was given a coat or two of Seal-a-Cell at the start. Based on that, I have made the decision to stop buying Seal-a-Cell, and buy Arm-R-Seal only. If you need more amber color than the Arm-R-Seal provides, try giving the piece a light coat of straight boiled linseed oil and wiping off all the excess. Give it a day or two to dry and come back with your Arm-R-Seal. Marc, that was a great demo and discussion. And hearing good Questions and good Answers is a double bonus. We must be cousins in a parallel universe, because we seem to be tackling the same types of projects/issues at the same time – quantum entanglement? Well, I just wanted to share some information about finishing I gained from a recent experience. You see, I just finished an entertainment center, made of hard maple solid and ply woods. In my research about how to deal with blotching, I read multiple posts on Sawmill Creek advising that an aniline dye was the way to go. So I tried it. My results were not good. I wiped some alcohol/Transtint-based dye onto an untreated test piece and ended up with blotch from hell. Maybe a water-based would have worked better, but I didn’t bother to try. I really like the results you got with the SealCoat/gel stain – very nice. I’ll have to give that a try some time. In any case, I decided to go with a natural (no stain/dye) clear finish for my piece. I’ve finally figured out how to spray Lacquer effectively and am very pleased with the results. Hey, great answer, Marc. Thanks for that information. 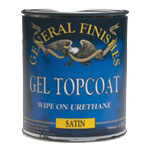 I also like General Finishes products. But I’ll forgo the Seal-A-Cell. I’ll give that technique of starting with a coat of BLO a try. I happen to have a can of it sitting on the shelf. And remember, no matter what conditioner you’re using, it doesn’t create a waxey buildup like all the others. Oh, one more thing. I think Wizer has a good idea there about “tapping the can”. Unfortunately, in order for it work, you’d have to supply a vent to eliminate a vacuum. The vent would supply air, thus negating the intent of preventing air from entering the can. Now, if you could come with a way to dispense finish in a collapsing bag, like cheap wine in a box, that would be awesome! Love your concept. You are a great teacher. I am getting ready to stain and finish the hardwood floor in my recording studio and your advice on sealing/staining gives me the confidence to do the thing. Actually, there is an accordion-like bottle for finishes. It looks like an accordion and as you dispense, you collapse it down. I remember getting email about it or maybe saw it on a site (I thought toolmonger.com), but can’t locate it now. It was on a closeout when I first heard about it so maybe it wasn’t popular. It would certainly do the trick and I thought of getting it for this reason but the size was too small. Marc, great show. 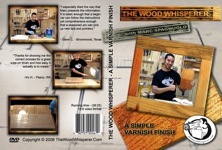 Here’s a tip I got from another woodworker in North Carolina. I found it really difficult to pour from those great big metal containers without getting stuff all over the work bench, floor, on your hands etc. (I’m all for sterilizing chisel cuts, but boy does it smart…). The secret is to pour towards the handle, i.e. keep the spout high. I know, it sounds ridiculous, but give it a try. Thanks Marc. I suppose you can apply water or alcohol based dye after a 1 lb cut. Real question. I have a JacPak CO2 Waist Band Air tool supply. I’m thinking I could give cans a blast of the CO2 before sealing the can for longer storage. On the other hand CO2 could react with some things. Perhaps Argon gas wouldn’t react but I doubt I could get a paint ball tank filled with it. Marc, I recall hearing or seeing somewhere that the difference in SealCoat and Arm-a-Seal is the wax is removed from SealCoat. The wax supposedly can cause top coat problems. Hey Richard. Give a little squirt of the CO2 and see what happens. While not an inert gas, it is still heavier than air and should displace the oxygen-containing air. Hey Robert. Just to clarify, you are talking about two different types of finishes. SealCoat is indeed dewaxed shellac. Arm-R-Seal is an oil-based urethane varnish. And yes, many folks believe that wax in shellac can cause problems for topcoats like Arm-R-Seal. Great Demo Marc, I also use Seal -a-Cell as a base coat and then muliple coats of Arm-R-Seal. I started using that when I read it was David Marks’ favorite finish. I have alway had good results with it. I’ll give this finish from your demo a try. I will say it seems the more I read on finsihing the more confused I get. But this seems pretty straight forward and easy to use. Good Job. As always, thank you for sharing your experience, skills, time and effort. Hope you and Nicole had a smashing Thanksgiving Holiday! Marc- thanks for recording the awesome live demo. No matter how many times I watch or hear finishing techniques, I learn more – probably because as you say the confusing products abound! I’m wondering about a comment you made during the show about putting varnish on top of the shellac/gel stain. When would you (or not) put another layer of shellac between the gel stain and a top coat of varnish? The layers of shellac below, between or on top of various other applications always confuses me. Hey Morton. Basically, I will use shellac to seal in dyes. The idea is that it stabilizes the color and locks it in before you add your topcoat. This by no means is always necessary. But its a good idea when you think your topcoat might moves some of the color around. For instance, a water based dye under a waterbased topcoat. You could very well reactivate the dye and push it around a little. So in most cases, its not a bad idea to seal it in. Most oil-based stains and gel stains are pretty stable once applied to the wood and don’t really NEED any special sealing step. And if Im not mistaken, the GF gel stains might even have poly in them, which helps lock in the color. Marc, two questions about using seal coats and dyes. First, my impression is that you always use dyes before a seal coat. Is this correct or can a seal coat also help reduce blotching before using a dye? Second, if you use water or alcohol dye on raw wood is there any need to seal it if the top coat is a clear oil based finish? Hey Ron. On some woods, dyes will blotch like any other stain. So its not a bad idea to partially seal the surface like I did in this video in an effort to calm down the blotching. But just like you saw in the video, the intensity of the color will decrease after the sealing step, simply because less of the dye is being absorbed. Now one way to get around this is if you are spraying the dye. It is possible to skip the sealing step and simply spray on very light coats of a dye mixture (toner), and avoid blotching. But you need to have spraying capability. Now if you apply a dye (alcohol or water) to a raw wood surface, it is still a good idea to seal first if you have a blotch-prone wood. If you have a wood that has no problems accepting color evenly (like oak, for instances), then you can skip the sealing step. This is the case regardless of what topcoat you decide to use. Hope that helps. Great video, Marc. For me, it cut out just as you were talking about the shelf life of the seal a cell. I tried re-running it, same thing again, no joy. I’m guessing it’s an issue with my computer because I don’t see anyone else mentioning it here. Oh, well. Marc – thanks for the help! I’m going to try this on a birch toybox I’m making for my kids. I’m curious what you would recommend for a topcoat? I was thinking of a couple coats of clear shellac, but I’m wondering if a wipe on or sprayed on poly would be a better choice? Well, shellac will certainly yield a beautiful finish. But poly would be more durable. So its really up to you. Some people just hate the way varnish looks and prefer shellac. Other folks find the shellac isn’t durable enough. I have been doing some research on how to stain my custom made maple cabinets. I have read alot about maple staining unevenly. This was a very helpful video. I was wondering..you didn’t mention applying a sealer after the gel stain. Is this needed? If so, what should be used. Thanks! Hi Tabitha. In most cases, the gel stain can be topcoated with just about anything once its cured. If you use one of the General Finishes brand, I believe there is even some poly in the mixture. That essentially “seals” the surface and locks the color in. But you still want to add a few coats of a clear finish over top to protect the color and the wood. This seemed very straight-forward after watching the video, however, after trying this method I think I must have done something wrong. My results look nothing like yours do, although my stain color is a lot lighter than yours. The wood doesn’t seem to be taking in any of the color. A light wiping to remove the excess leaves only a very light color which will not build up; even with additional coats on subsequent days. I thought at first that I may have put the diluted SealCoat on to heavily, but your results with even the full-strength version came out better than my gel stain. I have tried leaving it on for a few minutes and then wiping off the excess. While this “works” it leaves very dark areas and completely masks the underlying wood. I attempted this on birch plywood with a Lawrence-McFadden Georgian Cherry gel stain. I would really appreciate your thoughts as to where I may have gone wrong. Hey Jason. I haven’t worked with that stain before so I don’t know from experience how it applies. But not all stains are created equal. The General Finishes stain that I was using just might do a better job of transferring the color when the wood is sealed. You really need to test this stuff out using different concentrations of shellac and different color stains. Sometimes, because of the lack of stain penetration, you need to go a bit darker than you think. Or you can use a more dilute shellac. But its all about a compromise. And on some really gnarly blotchy woods, its going to be a tough battle. So i would recommend trying different test pieces to get the best results possible with your given materials. And if that doesn’t yield good results, try a different brand of stain. I really do have to say that practice does make a difference. After reading your reply, I have spent some time practicing/experimenting and I have definitely had positive results since. Thanks for everything! Thank you for posting this video. I’m from NC and have done a lot of stripping and refinishing of furniture in my life, but have been terribly afraid of beginning the staining and finishing on custom cabinets (birch walls and maple doors) that I had built in my home I am remodeling. This video was SO helpful! I am very grateful and now eager to get started. One question, do I light sand after the shellac and before the gel? And do I light sand after the gel before the varnish? Thanks SO much! I sand lightly after the shellac, but not after the gel. You don’t really want to sand raw color. So wait till you have a protective clear coat over the color before you start smoothing between coats. Good luck! Thanks! Also, having never used gel before, I’m wondering if there is a “very best” kind of satin finish for what will be much-used kitchen cabinets. There will be a lot of light in the house and have heard some things about urethane vs. alkyd (?). I did find a store where I can purchase the General Finishes gel oil stain. Now what clear satin finish is best? Also, do you take tips? $$$$ Priceless advice! I had custom made maple cabinets stained a medium to dark brown and they were varnished yesterday. Blotchy results. What does the painter need to do to fix this issue? The cabinets are for a modern/contemporary bathroom and they look more old country. Very disappointed. I will notify the contractor next week. I wanted your input. Love your video – the results are great on the gel stain (what I was looking for in my cabinets). Oh boy. Well the problem is the blotch is occurring in the wood itself. So the only way that I know to fix that is to remove the varnish and stain, and try again. Depending on the stain used, the grain may really try to hold on to the color in some areas. So depending on how much you are willing to sand back might determine how “clean” of a look you get. But, the varnish definitely has to come off. Good luck. Hi, I just saw your excellent video on preventing blotchiness. Unfortunately, I saw it too late, after I put the first coat of oil-based stain on my new custom-made mantel. I’ve never stained anything before. The mantel is birch and birch plywood. It seems to have a lot of knots and end grain exposed that turned almost black, even though my stain color is Minwax English Chestnut. The corbels are solid wood but have end grain exposed in the front that looks black now. I guess I will be doing a lot of sanding before I attempt it again with the shellac seal coat. Can the seal coat be used over stained areas? I will have to find a color of gel stain that is close to the English Chestnut. Or, could I put the shellac on just the dark parts (after I sand them down) (with an artist’s paintbrush for shellacking the smaller shapes) and then put the same English Chestnut in a second coat over the whole thing? I love how the color is looking on the good parts. (I did use a pre-conditioner but it didn’t seem to help). Thanks. I will check out your website before I attempt further wood projects. Hey Jennie. Sorry to hear about the mantle. Unfortunately, once you stain a piece like that, it can be very tricky to get all the dark stain out of the deepest and most absorbant grain. So you may have a significant amount of sanding ahead of you. Now if you can selectively access the end grain, you can certainly pre-seal that without sealing the rest of the wood. Since end grain can be SO absorbant, its not a bad idea to give the end grain one light coat, then follow up by giving the entire piece a follow up coat (including the end grain). This keeps things in balance a little more. The stuff is water-based and if you apply two coats, then follow up with your gel stain, I think you’ll be very happy with the results. The problem with shellac is that if you put too much on, you don’t get a lot of color into the wood and its a tricky thing to balance. So I would highly recommend moving toward the water-based stuff. Its much easier to work with. Hi, and thanks for taking the time to answer my question. Is it too late to use the Charles Neil’s Blotch Control on my mantel since I already have a coat of oil-based stain on it? (I know water over oil sometimes doesn’t work.) If it is too late, can I use the shellac over the oil-based stain? And thanks for the Charles Neil’s link as well. Yes on the shellac, and no on the Charles Neil stuff. If you are going to start over, the Charles Neil formula is a good option. Keep in mind that once the blotching occurs, the only way to get rid of it is to cover it up with more/darker stain or strip it down to bare wood and start over. I can’t get the entire mantel back to bare wood, since it has a lot of detail, with crevices that are holding the oil stain, plus it’s just too much work and too difficult (hand sanding). So I will have to sand selectively and use the shellac system. Hopefully it will look somewhat better than it does now. What what you recommend for Knotty pine paneling. Big project- 186 boards. Like the the Gel stain finish, but how should i finish. Should use the 1# mixture Bulls eye prior to staining? Arm-r seal? That stuff will give you better results than the shellac. This video answered part of my prevoiuse question. I think the Gel coat GF nutmeg looks great and GREAT videos thanks. Considering the mass amount of work to do with all the knotty pine paneling; is the ARM R Seal the correct finish? Well there is no “correct” product. I would say you are better off spraying than applying by hand though. You’ll get the job done faster. But that goes for any finish you might use. if it were me, I might look into a faster-frying finish like a water-based poly or a lacquer. I?m trying to finish birch ply for kitchen cabinets, I just want a decent finish without adding color or a 20 step finishing schedule. I was going to thin the bulls eye sealer, same stuff you used in the video, to around 1# spray it on, sand, spray water based poly on top. That is until I read the back of the can. It reads ?do not thin when using as a sealing/bonding coat?. Now I?m rethinking what I should do? Maybe I should just spray a diluted coat of water based poly as the base coat to raise the grain for sanding? I think that would be your best bet and its super easy to work with. I have a unique dilemma. I made a reptile enclosure out of maple, and am looking to stain it a deep mahogany colour, with a polycrylic top coat. I can’t use polyurethane because it is not “bearded dragon safe”. I’m a total beginner here, but if I use shellac, and then a gel stain, which is oil-based, I can’t use a water-based polycrylic finish, correct? I see that General Finishes makes a water-based stain that is slightly thicker, but I’m not sure about it. Would I have to use that with a conditioner first? What are my options here? Hey Lindsay. First, let me say that I am a previous bearded dragon owner. Love those little guys! Now on to the finish. If you let the gel stain dry completely (give it a good day or two), you actually should be able to topcoat with a water-based finish like polycrylic. Its a good idea to test on scrap first. And if you are even slightly uncure, try sealing the stain in with the shellac and then switching to your water-based finish. Should be no problem at all. This way you’ll be 100% water-based from start to finish. The video on staining blotchy wood was very helpful but do you have any advice for staining already blotchy wood? I am restoring the entry way of our 1914 built house that has Doug Fir wainscoting and mouldings. They were originally stained dark then painted. I have removed the paint with peelaway7 but the stain is still visible in a lot of areas and where the peelaway overlapped, the wood is bleached out. Do you have any advice to get the wood to a consistent color before I restain and finish? Well one thing to try is actual wood bleach. You might be able to bleach out some of the pigment/dye that was in the original stain. After that, I would recommend sanding or scraping. If you don’t get rid of the darker spots, they will always be an issue for you. Well, unless you stain the whole thing to match the dark spots. So I’d definitely try bleaching followed by sanding. Or aggressive sanding if need be. Thanks for the great video… This validates (almost) what I’m about to do with trying to match a crown molding in alder to my existing kitchen cabinets that are alder but I have one question. After waiting 1 hour with the shellac, I put my ‘custom’ Sherwin William stain (to match my existing kitchen cabinets). Lastly I put 2 coats of minwax water based satin polycrylic on the wood. (PS Sherwin Williams said that they cannot do ‘custom match’ stains w/the gel so I had to use their regular oil stain). PS — I asked Sherwin Williams about using the gel stain but I’m having them do a custom match to my existing kitchen cabinets and they said that you cannot use ‘gel’ for custom stains. But despite my pot-stirring, I really don’t think it is worth the risk. Sometimes a finish may appear perfect right after application only to fail a few years down the line. So my recommendation would be to use the dewaxed SealCoat instead. For a maple hardwood floor we have about a 1000 sq ft to sand and stain. Can we sand and waterpop, next day apply the cut seal coat, then use the jell stain? Would that work better or would waterpoping hurt us? We orginally sanded and waterpoped then stained with a minwax provincial stain with blotchy results. We’re about to resand the floor but I want to make sure we have better results without the blotchiness. Well first thing’s first. Don’t experiment on your floor. Go and get yourself a scrap piece of maple, preferably a cut-off from your flooring installation and use that to run some tests. If you are going to seal with shellac, you need to know how much color gets absorbed after the sealing step. That’s something you want to work out first before applying to the entire floor. And yes, the steps you listed will work. But I would personally cut out the grain-raising step. The sealer will probably raise the grain slightly and you can simply scuff sand afterward to smooth things out. Then apply your stain. Thank you for the great video–It was a huge help! I am having some trouble getting the gel stain to match a few other stained pieces though. Is it possible to use an oil based stain (like minwax) on top of a gel stain? Or can you only use a gel stain on top of an oil based stain? Thanks! Gel stains may contain some poly so you want to check the label. If that’s the case, you would not want to go over top of that with a regular oil stain. It won’t be able to absorb and consequently, won’t dry. But you can indeed go the other way around. I am staining/finishing french doors(fir) for a customer. We used Minwax wood conditioner before applying the Minwax English Chestnut stain but still got some blotchiness. Customer wants us to put on more coats of stain, which I don’t believe would even out the appearance. Should we consider sanding to bare wood and starting over with a different product or try the multiple coats? I think your instincts are right on. Multiple coats won’t help. What I would suggest is trying a gel stain in a slightly darker color. The gel stain might help even things out as the color sits on the surface and doesn’t exactly absorb like a regular oil stain. If this doesn’t work, it might be time for a do-over. Also consider a second option, which may not really work for you depending on your equipment and space. That is, to use HVLP and toners to cover the blotchiness. This method will hide the grain to some extent but will allow you to cover up the unevenness. This Video has been a life saver. I am an amatuer woodworker who has built a lot of things but mostly painted in the past. I am building a desk and my hsband picked a dark stain look. So not thinking before the build I picked maple which I have worked with in the past and was familiar with, but when I went to stain it a dark expresso stain it looked horrible. I added a second coat which did nothing. I searched the web High and low and found your web site. Then I saw your video and added a Java gel stain over the top. The difference is exactly how I wanted it to turn out in the first place. I have now added a coat of shellac and will be adding a top coat next weekend. I have become a true fan Thank you. I have watched several videos. With the top coat I am debating on spraying it on vs wiping. I have a spayer and have built a pull down paint booth in my garage but I am afraid of making any more mistakes at this point. One question, My sparayer is a simple Craftsman sparayer (model 155350) and is doesnt spec out the needle size. In the past it seems like things I have sprayed come out kind of gritty which I think means that the presure is up to high or could it mean that my needle is too small for the viscosity? Can I measure the needle with calipers? Is it the diameter size that is measured? I have purchase the finishing DVD and will watch it before the next step. Hey Liz. If you aren’t that comfortable with spraying or if you aren’t 100% confident that you can get good results with the spray unit you have, I would highly recommend going with a simple wiping finish. Wiping is an incredibly beginner-friendly technique that gives professional results. If you have the video, you’ll see very soon just how simple it is and how good the results are. But to answer your spraying question, to my knowledge, the needle sizes are measuring the opening or the actual diameter of the needle itself. So a 1 mm needle would actually measure 1mm at the tip. As many on here have already said, THANK YOU! I’m learning so much! I picked up some GF gel stain today and noticed that it says not to thin on the label. You said to thin it just a bit before applying to help with the viscosity. What do I need to use to thin it and do you have a recommendation for how much or is that something I just need to play around with until it comes out right? Thanks again for everything! If you do thin, don’t thin it very much. Otherwise you defeat the purpose of having a gel stain. If you can use it without thinning at all you will be better off. But in some instances, I find it a little easier to work with if I add just a little mineral spirits. We hope to refinish maple kitchen cabinets that have a frost glaze finish with java gel stain. Do we need to apply a seal coat or blotch control formula before staining? Can we just scuff the existing stain or must it be fully removed before the staining process can begin?There is so much differing information on the web that we are confused in what to do. This is our first woodworking project so any guidance you can provide will be greatly appreciated! Hi Liza. I’ll be honest that I am always hesitant to give refinishing advice, especially on kitchen cabinets, since there are so many variables at play. And honestly, doing a full kitchen cabinet refinish on maple cabinets is something that I personally consider outside the normal DIY category, though many folks do attempt it. Many folks also wind up very frustrated in the process. That’s not meant to discourage you, but to make sure you know what you’re up against. There is a lot of different info out there, primarily because there truly are a LOT of different ways to get the job done. And while some work better than others, many of them are perfectly acceptable. So all that said, if you’re dealing with raw unsealed wood, yes you want to take measures to control blotching. And while you can certainly layer finishes and stains over one another, it is usually best to strip and get back to bare wood so that your stains and finishes have the best adhesion and depth. I bought a can of Minwax oil stain BEFORE watching this! I tried it out on a small piece of shellac sealed wood. Well — it’s not quite what I’m hoping for. The few times I used the stuff, I wasn’t happy with it. So I stick with General Finishes. Maybe try a few paint stores to see what brands they carry and recommend. I stained all of my maple kitchen cabinets because I wanted a darker look and all turned blotch, this was several years ago! What a horrible experience. I then had to paint them and not even get to stain. Now I’m onto re try mode on my bathroom cabinets and stair railings. I don’t want to paint them, so am going to do as you suggested in the video and hope for better non blotchy results! Now for my question, do I need to sand to the bare wood or is it okay to go over the already lacquered wood that the manufacturer put on to begin with. Or should I just lightly sand first? Thank you, oh and if it helps I have natural knotty maple cabinetry and banister. Great video and fun to watch! Hate to say it but you should probably strip and sand the doors down to bare wood if you want the stain to absorb. Good luck! Have you ever tried this shellac and gel stain process on fir? I have a new vertical tight grain fir entry door that I would like to have a dark walnut color. I realize I have probably picked the worst type of wood to stain a dark color, but it is the type of wood door that is cheap and readily available in my area of the west coast of Canada. I found this awesome video of yours after I destroyed my beautiful alder front door. I had melted crayon all over the door, so sanded it off, and applied an oil stain. The door is horrible. The blotches look like a cow hide is hanging on my front door. Tomorrow I will visit the store, and purchase all you suggested, as well as a nice thinner to see if I can salvage my door. Thank you again. Can you use the Charles Neil Blotch Control under a oil based stain to prevent botching? Also, you are talking about “lb” cutting. Can you explain a little more about what that is? Hey Jeremy. You can use his formula under oil-based finishes. I have done it with decent results. But Charles has stated that it works best with water-based dyes and finishes if I’m not mistaken. So it’s best to test on scrap with your particular material first. As for shellac dilutions, it’s a little hard to explain quickly. Shellac is diluted based on the weight of flakes in a particular volume of ethanol. So for instance, a 1 lb cut is 1 lb of shellac flakes in 1 gallon of ethanol. A 2lb cut is 2lbs of flakes in 1 gallon of ethanol. Most commercial shellacs are 3lb cut. But for general woodworking when we mix our own flakes, we usually use 1 or 2lb cut. So because we never really need a full gallon of shellac, we need to do calculations to accurately mix smaller amounts. Or if you want to dilute a mixture accurately, you’ll have to do a calculation then too. But I honestly just dilute and ballpark it. I enjoyed your video. With that said, I just built a beautiful irish pub style in my lower level and am now finishing it with less than desirable results. Bar was built with birch veneer using maple for all moulding. I was told by Rockler wood shop in my area to use a transtint dye (vs stain) because I used two different species of wood and this would get best results. They also suggested using denatured alcohol with the dye. Additionally, they recommended me using Minwax pre-stain conditioner, which I did. However, blotching still occurred especially on the maple. I have only done one area of bar and quit because of results. What can I do to ‘repair’ this? Start over or cover it up. When it comes to blotch, you have light and dark areas. So if you don’t want a do-over, the only thing you can do is apply a thicker stain or even a toner to bring the entire surface into the same dark color. This will mask much of the grain and might not be what you’re looking for. The CN solution works like a charm and allows dyes to penetrate evenly. Great video, and as a newbie I found a little bit difficult to understand. I have a banister (new) in maple that needs to be stained. My floor guy is telling me about the blotchiness and talked about water popping, staining and polying. After watching your video, I am convinced that this isn’t the route I want to take. I also need to know (in case I do it myself) the timing between coats, what has to stay wet or be dry and wiping.) THANK YOU!!!!!! Anyway, thanks for your site. I enjoyed watching the table saw videos and now this one too. I was able to extend my table saw width and can now do nice wide straight cuts, easily! For a project (3D printer cabinet) I cut the wood freehand on my table saw and it was terrible. It was straight but had a slight waviness that made it look BAD! After extending the table I redraw everything in FreeCAD with 1/4″off each side and the overall size still works. I noticed in your one video (for a table) you were using SketchUp. I use FreeCAD for designing 3D printed objects, but people use SketchUp for that too. I actually used my 3D printer to print the panels of my cabinet at a much smaller scale and it gave me a great visual indication of what the end cabinet would look like. This video has helped me tremendously too! I’m not one for commenting on blogs, etc. but I’m really glad I found your website/videos! Thank you! Hi Marc, great video. I am in the process of building a few wine boxes out of cherry for family christmas gifts. I was wondering what would you suggest using for clear coat? Also, I have heard that it works best if you put another gel coat on top of clear coat. Do you feel this is true from your experience? What are the steps you should take after the one layer of gel coat? A couple of years ago I discovered a great product called the Stop-Loss Bag. You simply use a funnel to pour your finish into a wide-bottom plastic bag, “burp” the air out, and seal it. I use it for shellac, poly, and other fishes. Simple and very effective. It’s available in several places but I included the Woodcraft link ‘cuz it was the first to pop up. I know this is an old video but I’m looking to get that dark walnut as Java is too dark, without blotching on pine. What gel stain brand and color would you recommend? Hi Marc, I know I’m really late to the party but I am losing my mind trying to stain some maple plywood. I prepped a decent sized scrap piece and divided it up into several sections, I did no sealer, 2lb cut of dewaxed shellac, 1lb cut and pre stain conditioner. On each of those I tested a regular stain and gel stain. The regular stain on the 2lb cut actually came out the nicest but when I flipped the plywood over and tested the same thing on a larger area the grain was completely obscured and it just looks terrible. Any advice would be great as this is like the 4th time I’ve tried to do this and it keeps coming out the same. Hey James. This is really one of the challenges of staining plywood. It can be unpredictable and what happens to one side may not happen to the other. So you might actually need to treat the two faces differently depending on what gives you good results on each face. And if you aren’t getting good results anywhere, it might be time to change up your methods. Some species and some plywood grades just won’t stain nicely no matter what you do. In those case, it’s best to look into a toner. Toners are a great way to color temperamental wood because they add color in the topcoat. The color never really absorbs deeply into the grain and doesn’t have an opportunity to blotch. This method also typically obscures the grain a bit, because you’re essentially layering color on top of the wood. But if you get it just right, it can look pretty nice.